This range of CW cable glands is manufactured from high graded raw materials and are used in both indoor and outdoor applications. further, these can sustain in heavy to normal weather thus ensuring optimum performance. These cable glands secure electrical continuity between amour and gland entry component. 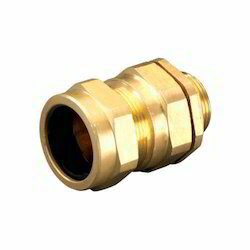 We have an offer of an exclusive range of BW cable glands which is used in both indoor and outdoor applications. These are specially designed to sustain in all kinds of climatic condition and can resist water and heavy storm. Our range is further provided with a wire that is used instead of a knurled cone. Also available in CIEL(cast integral earth lug) for orders add" C " to prod. code. Looking for CW Cable Gland - 3 Part ?